Exhilarating new adaptation of an Aussie classic. JOAN Lindsay's iconic book Picnic At Hanging Rock and the Peter Weir film adaptation are among the most treasured works in Australian cultural history. This impressive and haunting new adaptation takes Lindsay's 212-paged tome and fills it out with luscious visuals, intriguing backstory and magnetic performances. It's like the series itself has taken on something of the story's supernatural spirit with its hypnotic allure. The story of three girls and their teacher who disappear during a Valentine's Day picnic in the Macedon Ranges has puzzled generations. Many are convinced the story is real despite disclaimers to the contrary (though Lindsay also at times refused to deny there was a root in truth), which lends the tale an air of ethereal mystery. Picnic at Hanging Rock for a new generation. Picture: Foxtel. The DNA coursing through this Foxtel series is secrets, clear from its opening scenes in which Mrs Appleyard (played here by a dazzling Natalie Dormer) is introduced in shadows and silhouette, her voiceover hinting at an agonising past she's fleeing, here "at the arse end of the world". She's the first of many complex characters we'll meet but, at least in the first episode, she remains the most intriguing with her mix of sexual repression, menace and vulnerability. She guards her secrets fiercely, and when that's threatened, she pounces. But whether she'll be able to keep up her veneer of respectability and refinement will have to be seen as the series progresses. She tells her charges, especially the free-spirited and recalcitrant Miranda (Lily Sullivan), that a woman's value is defined by men, but there's a trace of bitterness in the declaration, one that is sure to be mined. Sullivan's casting as Miranda is clever because the filmmakers haven't sought to replicate Anne-Louise Lambert's memorable portrayal in Weir's film with another blond waif. Here, though she looks like a Botticelli angel, Miranda feels more substantial and she appears to have much more of an inner life. The supporting cast includes Samara Weaving, Yael Stone, Madeleine Madden, Sibylla Budd, Don Hany and Lola Bessis. Picnic At Hanging Rock may retain its vintage period but it has a modern sensibility lurking beneath its 1900-set story. There's an invigorating rock 'n' roll energy mixed in with the tea parties and doilies. Canadian director Larysa Kondracki, who directed the first episode and two others, is channelling Sofia Coppola's female gaze, particularly important in a story anchored by female characters. The production looks spectacular, from its injection of music video slo-mo into more formally composed frames, to the overexposed cinematography of the picnic spot where lurid greens and stark whites create a mystical playground stuck in a time warp. The enduring appeal of Picnic At Hanging Rock is rooted in the mystery and this adaptation wisely omits Lindsay's "lost chapter" that explains what happened when the girls vanished behind those rocks (do yourself a favour, don't seek it out, the story works better without the answers). In keeping it enigmatic but still enriching it with deeper character work, the legacy of Picnic At Hanging Rock is safe. 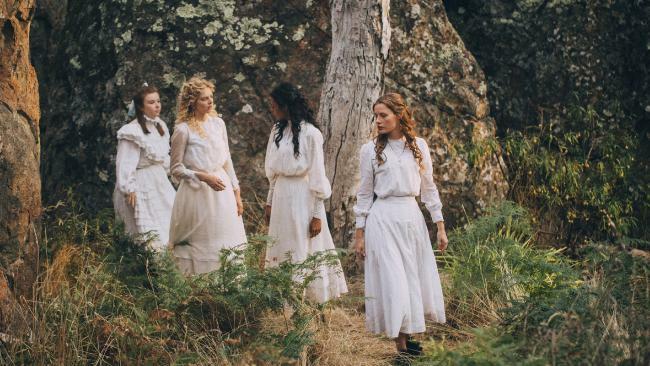 Picnic At Hanging Rock premieres on Showcase on Foxtel on Sunday, May 6 at 8.30pm. All six episodes will drop on Foxtel Now after the broadcast.